The COUNT Motorized Delivery Machine is a controlled delivery system that allows for stock to be controlled to a slow output. The Motorized Delivery Machine offers variable height adjustment from 30 to 40 inches, and also 15 degrees of incline or decline to match up to almost any type of equipment, with custom bases also available. 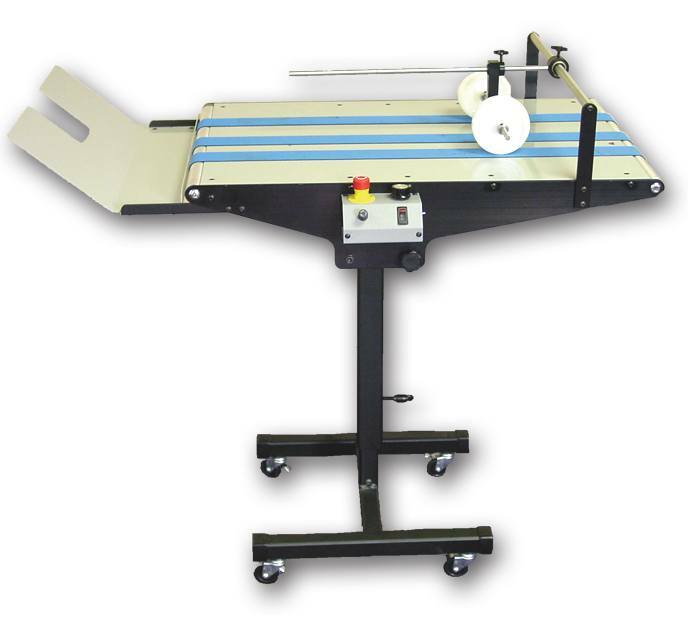 Numbering, perforating, and scoring machines, folders, addressing systems, and laminating equipment, are just a few examples of the type of equipment that can benefit from the motorized delivery. The key to the COUNT Motorized Delivery Machine is the inverted photocell sensor that detects the presence of paper or other substrates as it moves above it. As long as product is delivering on to the conveyor, the belts are in motion, the second that an interruption in the feed or delivery flow is detected; the conveyor will stop and restart when product begins delivery again. Most conveyor delivery systems are set in a continuous motion, with only an adjustment for speed. This causes many problems when presented with inconsistent product feeding, increase or decrease of speed, and the starting and stopping of work flow. With a speed adjustment to accommodate product up to 500 feet per minute, and a ‘fast forward’ switch to help gather product, the Motorized Delivery Machine is a ‘must have’ for any shop looking to tame their output and gathering problems and create a smooth work flow from beginning to end. Single Phase 110V/60Hz or 220V/50Hz 15 Amp.